Have you been to Lenoir Preserve in Yonkers lately? Probably not. After all, unless you live in the northwest Bronx or any of the rivertowns along the Hudson, you probably take your leisure in more convenient natural settings. But Lenoir, seat of the Hudson River Audubon chapter, has always been a special place for me, Sara, and the kids. They get to tromp around fields and woods on a splendidly maintained estate-turned-preserve while I, depending on the season, get to enjoy the different seasons of birding. Come early June, Lenoir becomes rather quiet in an avifaunal sense, but thanks to the meticulously crafted butterfly garden, there’s still plenty to see. She’s a beauty, isn’t she? 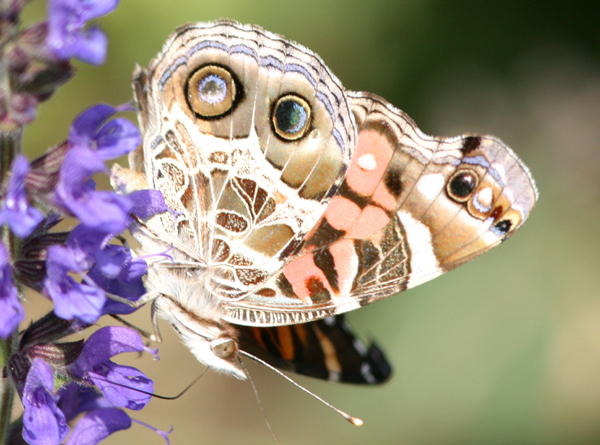 The American Lady (Vanessa virginiensis) ranges throughout North and Central America. Frequent but never common, this butterfly can be distinguished by the equally pulchritudinous Painted Lady (V. cardui) by those two big, beautiful eyes on its hindwing. Thanks for your post about painted ladies. With the excitement of migration finished, its time to turn our attention to the beautiful butterflies in our yards and parks. Where Are You Birding this Second Weekend of March 2009?